Fusing solar technology with a building is an area that tends to invite creative ideas. An intriguing design caught our attention at Intersolar in San Francisco this week: a solar panel with a honeycomb structure that can replace a building’s glass facades. The panel, appropriately called BeeHive PV, comes from an Israeli startup, SolarOr, which just completed the design and is hoping to attract investors and partners to market and install demonstration projects. 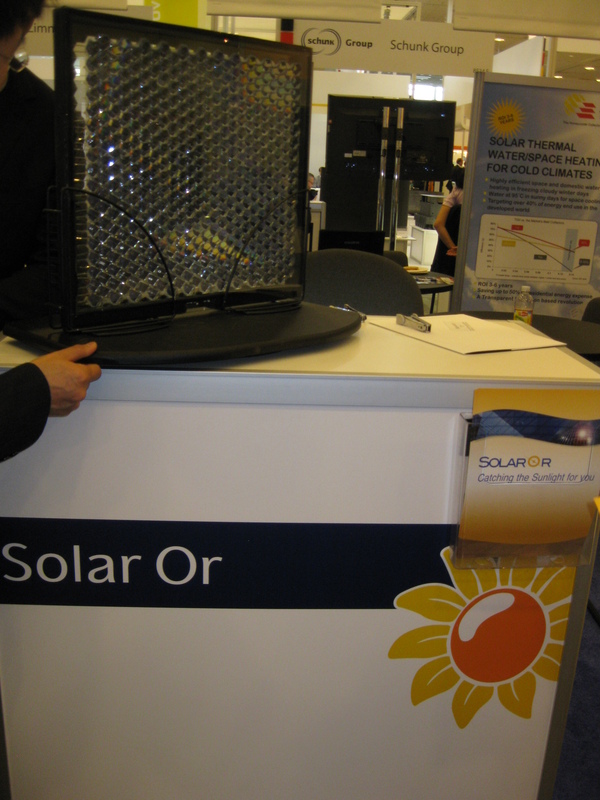 The BeeHive is the first product for the company, which so far has raised about $1 million in angel funding, Avi Sasi, the chief operational officer, told us at the company’s Intersolar booth. The company, founded in December 2007, is looking to raise a $5 million round, he added. Sasi has been showing off a sample-size panel, which is made up of a double-glazed glass sandwiching that looks like a cross section of a honeycomb. The honeycomb is made of acrylic (it’s polymethyl methacrylate, or PMMA, for those who are curious), and inside each hexagonal cell is a silicon cell. The hexagonal design serves to concentrate the sunlight by 2.5 times onto each cell, Sasi said. A 1-square-meter panel would be able to produce 140 watts of electricity, giving it a 14 percent efficiency, Sasi said. The idea is to install these honeycomb panels as the sides of a building. Integrating solar technology into buildings is an appealing idea because it serves a dual role: It provides both insulation and clean power. But the idea has yet to take off for several reasons. Architects often are critical of the aesthetics of building-integrated solar designs. Regular glass facades on a commercial building tend to have a clean look. They also often come tinted to reduce the amount of light and heat that enters the building, and the tinting gives architects another opportunity to create a particular look for the building. Conventional solar panels sport dark blue or black cells that are covered by glass on the top and are protected on the back by a white polyvinyl layer. They produce power but also block out the light. 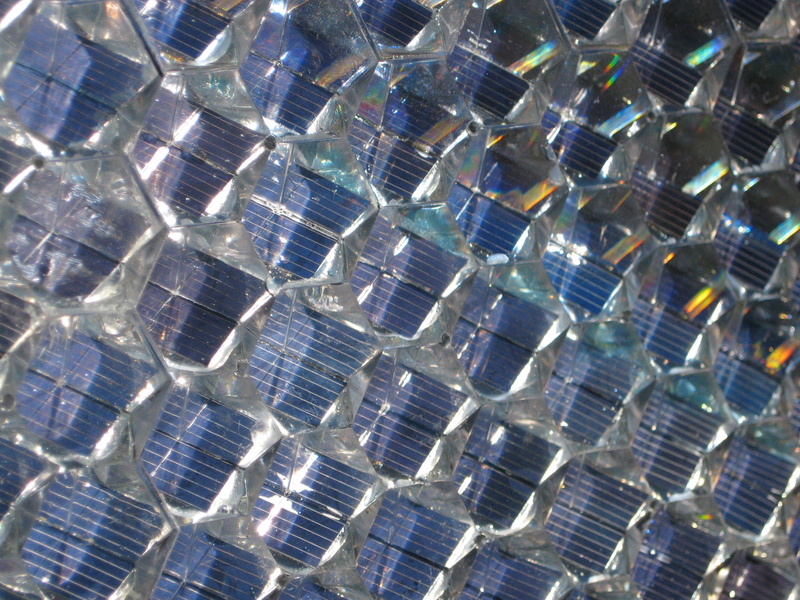 Some manufacturers encase solar cells in glass and space the cells apart to let some light in. But that design allows light to come into the room like a spotlight; such light can’t scatter and fill up the whole room. Some manufacturers are working with different materials that make it possible to lighten the color of the solar cells and give the whole panel a more transparent look. To get maximum exposure to sunlight, building-integrated solar equipment needs to face south, same as the ideal orientation of conventional solar panels on the rooftop. Any shading, from shadows cast by adjacent buildings, for example, will significantly reduce the amount of power produced by the solar cells. Solar panels that sit on the rooftop also should be tilted to get the maximum sun exposure. A solar facade is likely to be vertical, however, so SolarOr has designed the honeycomb structure (and the solar cells inside) to slope at a certain angle. The company can adjust the tilt to suit the location of the installation. For people who expect a short payback period for their solar investments, a building-integrated system may not be attractive. But architects and building owners who embrace solar facades are likely to see power generation not as the chief goal but as a bonus, something that wouldn’t otherwise happen with conventional glass facades. Which is all the more reason why a solar-facade design has to be attractive and perhaps even provide a “wow” factor to impress visitors. SolarOr joins some other companies that seek to use optics and solar cells ensconced inside two layers of glass to produce electricity. In fact, another Israeli company, Pythagoras Solar, also has been working on such a design and recently won $100,000 from General Electric for its innovation. Radio shack was selling silicone cells under bumpy plastic decades ago. It worked well because it was designed to redirect solar rays from a large number of angles. It worked ok laying level and came with two aluminized side panels. Maybe the panels/regular glass could be used as accent strips, but what would you do on the north side of the building? I don’t really understand the structure of these panels. There is hexagonal net made of PMMA and each cell is filled with silicon which can maintain different angles of the PV element. And all that structure is between two double glazed glasses. But what is the exact form of the silicone cell? Do you have a cross section? From the images I see that the PV element is square.. I can`t see how that square matches the hexagons.. What is the exact 3d configuration of the cells? I don’t really understand the structure of these panels. There is hexagonal net made of PMMA and each cell is filled with silicon which can maintain different angles of the PV element. And all that structure is between two double glazed glasses. But what is the exact form of the silicone cell? Do you have a cross section? From the images I see that the PV element is square.. I can`t see how that square matches the hexagons.. What is the exact 3d configuration of the prisms?